Now any hope Jaymee has of making things right rests in a man she barely knows and is afraid to trust, a man with his own demons to fight. Up against years of deception, they rush to identify the killer before the evidence – and Jaymee's daughter – are lost. 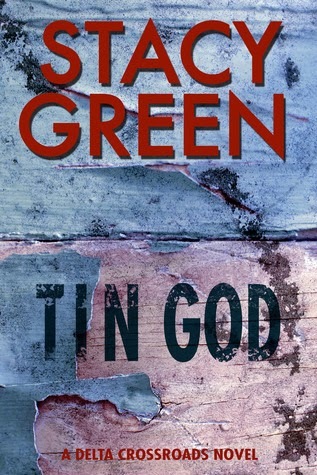 TIN GOD is an action packed romantic suspense/psychological thriller featuring a strong woman determined to find a demented serial killer and find justice for her child. I love romantic suspense novels but after a time they get predictable; cookie cutter scenarios. But Tin God is a breath of fresh air. The first in a new series, Green grasps the reader's attention from the very first page and takes you on a whirlwind journey filled with twists, turns and many surprises. Jaymee was forced to give up her daughter when she was just sixteen. But, the guilt has eaten at her for years so she starts to look for her. She enlisted the help of her friend Lana but Lana was murdered soon after. Jaymee isn't to be swayed though, and continues to seek out her child. However, the closer she gets, someone else dies. Lana's husband, Nick, has always wanted justice for his wife and has never received it. Receiving a letter from the murderer is another clue and one that Nick takes full advantage of. He soon starts working with Jaymee on what someone is trying to keep covered up, find her daughter, stay alive and stop the killer! Small town dynamics, likable and compelling characters that are very well developed, a plot that will keep you on the edge of your seat and snazzy writing mesh together into a keen, satisfying read. In fast, I can't wait to delve into the next in the series, Skeleton's Key.